Michael Dunlop and Ian Hutchinson in last year's tense Senior TT press conference. 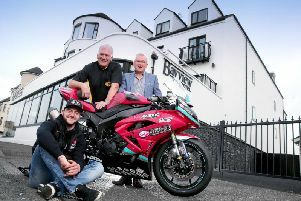 The rivalry between Michael Dunlop and Ian Hutchinson looks set to burn as fiercely as ever in 2017 as both riders aimed barbs at one another during the official launch of the Isle of Man TT in Douglas. The pair dominated on the Mountain Course last year, with Ballymoney man Dunlop winning the Superbike and Senior races on the Hawk Racing BMW, while Hutchinson repeated his 2015 treble, notching a brace on the Team Traction Control Yamaha R6 in the Supersport class and winning the Superstock race on the Tyco BMW, ending TAS Racing’s long wait for a return to the top step at the TT. Dunlop, who became the first rider ever to lap the 37.73-mile TT course in less than 17 minutes in 2016, also set a new outright lap record in the Senior at 133.962mph. Yorkshireman Hutchinson twice had to play second fiddle to the 27-year-old Ulsterman in the premier races and has made no secret of his desire to turn the tables in June. Relations between the pair deteriorated during TT race week, culminating in Hutchinson launching into a rant during the Senior press conference, accusing Dunlop of spreading a rumour that the pistons in his race-winning Yamaha were oversized. However, the controversy was actually sparked by a comment made by the TT’s then Technical Director Adrian Gorst, who later issued an apology and said the pistons met the necessary legal requirements. Hutchinson took to social media to apologise to Dunlop on Twitter, but the atmosphere between them remains frosty and it is clear there will be no love lost as they prepare to do battle once again. Speaking at the TT launch at the Villa Marina on Thursday night, Dunlop said Hutchinson should count himself lucky he didn’t take over his ride on the Tyco BMW. Turning his attention to the TT, where Dunlop has now won 13 times, he added: “I’m the only man to do a sub-17 minute lap and I didn’t just do one, I’ve done about five of them, so it shows it was no fluke. “I know how quick I can go and I know I can go even quicker because I’m into the sub-17s by a good seven or eight seconds and that’s even with slowing down to come into the pits. There’s more left in me and I’m ready to take it to the next level. Hutchinson, who drew level with Mike Hailwood last year on 14 wins, said rivalries were part and parcel of the sport but claimed his spat with Dunlop last year ‘went too far’. Both riders will go head to head for the first time on the roads this season at the Vauxhall International North West 200, where Hutchinson won the Superstock race last year while Dunlop set a new outright lap record as he claimed Superbike glory.